You’ve been really stressed out lately. You can feel it in your back, your neck, and even your shoulders. You need to incorporate a little more relaxation in your life, so you need the best neck and shoulder massager you can get. Because who has time and money to go out and get a massage in a spa whenever they’re stressed? Luckily for you, we’ve assembled a buying guide with some of the best neck massager reviews. Massage Heads- You want maximum massaging power, and the number of massage heads can help you achieve that. More massage heads can help work out kinks more efficiently and quickly. Although, there are great massagers with fewer heads as well. Directions- You want a massager that can change directions to work out all your kinks quickly. A change of direction can help the muscle stretch back out and feel relaxed quicker. Some massagers allow you to control the direction change, while others do it automatically. Heated- Heat can help soothe swollen or aching muscles, and a heated massage can make you feel more relaxed. Heated massages can also make your massage more effective in soothing your muscles and fully relaxing you. Some users, however, do not like heat in their massage. Auto Off- Does your massager turn off automatically? This seemingly unimportant feature actually comes in handy when you have an especially good massager. Why? Because when you doze into relaxation wonderland, you won’t be worrying about your massager overheating. Weight- How heavy is it? If you’re looking to transport your massager between work and home or take it on vacation with you, you’ll need to be able to carry it easily. You’ll also want something lighter weight if you’re going to be wearing it around your shoulders. Warranty- Knowing that the manufacturer is confident enough in the quality of their product to extend a warranty is a great thing for your peace of mind. Keep in mind, however, that products with warranties can sometimes carry higher prices than products without them. Let’s get hunting for the best shoulder massager out there. Our helpful buying guide has assembled some of our favorite neck and shoulder massagers so that you have a wide range of choice when looking for a massager. If you just want the top hits, check out our first two- our top and budget pick. If you really want to be sure you get the best, be sure to read through the whole guide so you can find the one that's perfect for you. Our top pick, the Five Star neck massager really lives up to its title. A fabulous shiatsu massager, with 8 kneading rollers and 2 massage directions, this massager is sure to soothe away all that stress from the office. It includes an easy three button control system. This massager also includes a heating function, which can help work all that tension out of your muscles. It’s not just for your neck though. It can be used on your shoulders, back, arms, waist, legs, or any part of your body really. One of the best things about this massager is that it’s portable. It comes with both an AC and a car adapter. Imagine your drive to work in the morning with this massager hugging you through every red light, traffic jam, and texting driver. It almost makes your commute sound like something you want to do every morning. 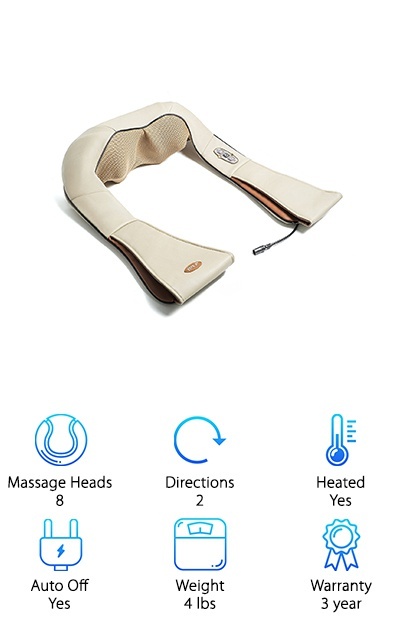 Truly create an oasis for yourself with this neck massager, at home or in your car. Our budget pick, the 1byone massager is a great pick for people looking for the maximum amount of soothing massage comfort without spending a lot of money. This massager can help relieve soreness in your neck, back, shoulder, abdomen, waist, leg, or arm muscles. The pillow style makes it easy to place anywhere you need it. 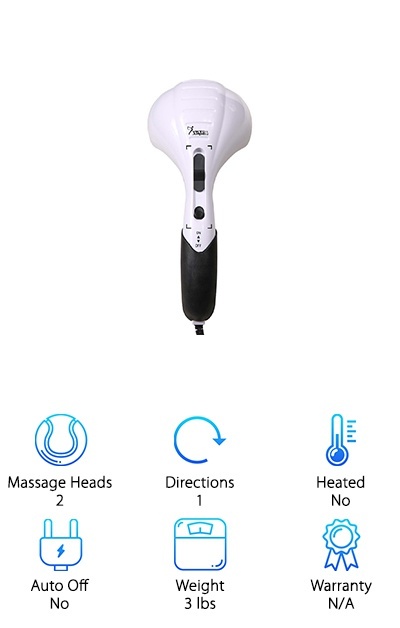 It has one button that controls the soothing heating function and the power. This electric massager includes the option to move the massage node clockwise or counterclockwise. It even automatically changes the direction of the rotation every minute, so you feel constantly cared for. It includes an adjustable elastic strap to make it easy to attach the pillow to your seat in your office, or even your car seat. That’s right, our budget pick also comes with a car adapter for maximum comfort everywhere you go. Because of its size, this is also a great option for people looking for a good travel option for their massager. 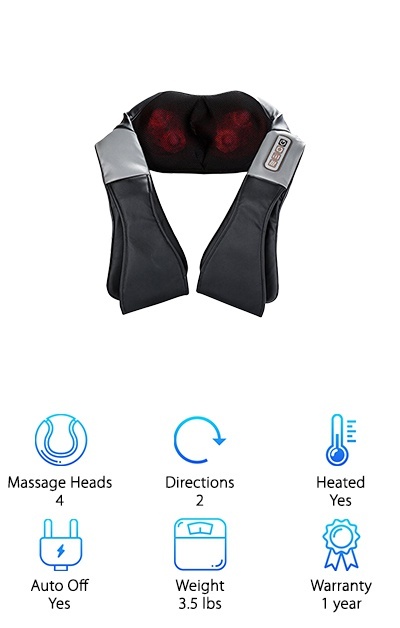 This heated massager comes with an added bonus. The hand pockets are equipped with vibrating pads so your hands can be massaged while you relax into your neck massage. This allows you to completely relax as the 4 massage balls knead through all the tension from that awful conference call you had earlier. The heating function helps soothe your muscle aches and pains, whether from hunching all day or from a chronic pain. 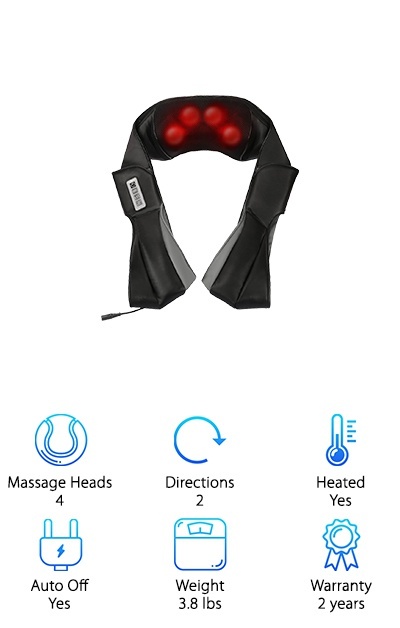 The massager turns itself off after 15 minutes, so you don’t have to worry about accidentally falling asleep with it on. Go ahead, you’ll probably be so deeply relaxed and at ease that you’ll fall into a little nap. The hand vibration is a great relief from long days of typing or writing. You can speed up or slow down the kneading speed between three settings. Those settings are low, medium, and high. This massager makes a great gift for yourself or anyone else in your family. This massager provides a deep and soothing kneading massage. It’s U shaped design makes it comfortable to wear and hold around yourself as it massages all your worries away. It has three speeds, which you can adjust freely to fit what you need that day. You can also swap between fast, medium, and slow to provide an interesting massage that kneads away the troubles of the day. Its simple controls have four buttons controlling the heat, direction, speed, and power. This massager even comes with its own carrying case, for taking on trips or transporting to the office. This massager also comes with a car adapter, so you can relax anywhere you need to. 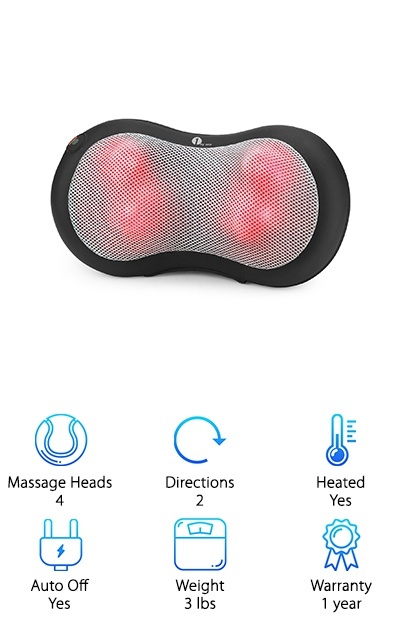 The massager has an auto off feature, so it doesn’t overheat or wear out the battery if you accidentally fall asleep with it on. This feature turns off the massager after 15 minutes. You shouldn’t use this massager on one part of your body for more than 30 minutes, to avoid discomfort. 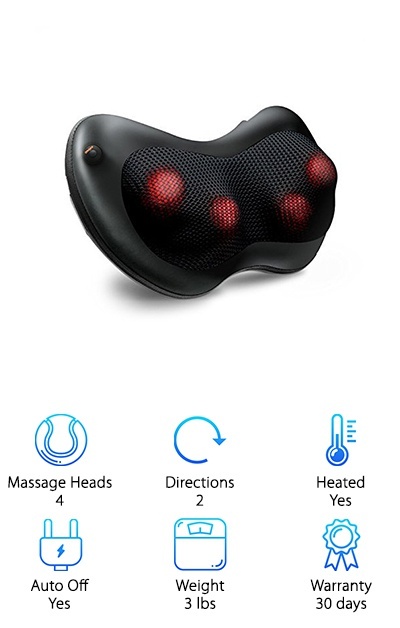 This massage pillow is designed to target your aches and pains. It can be used to provide an invigorating shiatsu massage. The soft fabric makes it easy to let yourself sink into this luxurious massager. It can help to work out all your sore muscles, as it can be used for a full body massage, you can use the massager on your legs, arms, back, or any other part of your body that’s feeling fatigued from your week. This massager comes with a heated function for maximum soothing power. The heat will melt all your stress away with the push of a button. The springy massage head feels like a pillow. It also has a built-in overheating protection mechanism. It powers off after every 10-minute cycle, so you can use this soft and fluffy massager to help soothe your aching muscles into a deep and complete sleep. It is portable and easy to operate, so you won’t feel any additional stress trying to operate your massager. 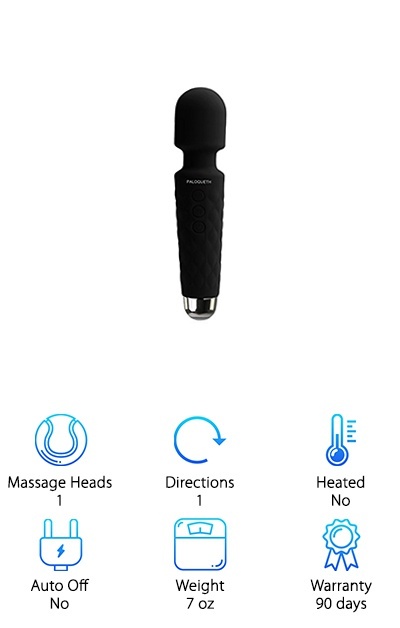 This luxurious massager ticks all the boxes. 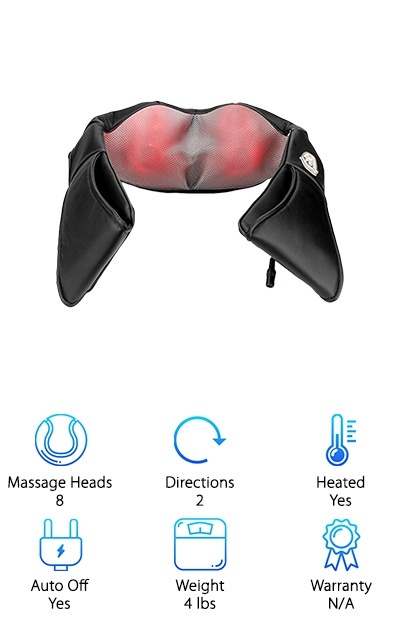 It comes complete with 8 massage heads with dual direction massaging power. The heated feature ensures that you are blanketed in warmth as well as relaxation and comfort. The massage nodes change direction every minute during your cycle to thoroughly eliminate any aches or pains in your neck, back, or shoulders. Each session is 20 minutes, after which the massager shuts off automatically. This means you’ll never have to worry about accidentally leaving it on and waking up with over massaged muscles. It comes with both AC and DC cables, so your massager can go anywhere you can go. The eight nodes go deep to eliminate tension and give you the best possible massage. Massage can help reduce stiffness, soreness, stress, and anxiety. So keeping this massager in your office can help you feel less stressed out by that 8 AM deadline or the upcoming meeting with your boss. Approach your life with confidence after this massager works all of your worries away. 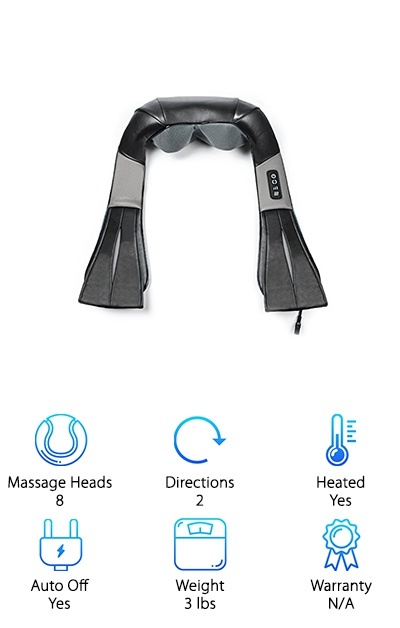 This double head massager is great for people who really have specific places on their neck or back that need to be massaged. Its design allows you to position your massager right on that spot that’s been bothering you all day. It even comes with three different sets of soft massager heads to ensure you’re getting your ideal massage. These heads mimic the effects of acupuncture massage, deep shiatsu massage, and Swedish massage. This helps you choose whichever type of massage is right for you that day. Switch between them with a simple click. This massager can be used on any part of your body, from your feet to your neck. The powerful motor runs up to 3,350 pulses per minute, delivering strong and powerful massage every time. The ergonomic, nonslip grip ensures that it’s easy for you to reach all those hard to get spots that other massagers miss. This massager comes with a 71-inch cord. This U shaped massager provides a great relief for anyone experiencing aches and pains in any part of their body. 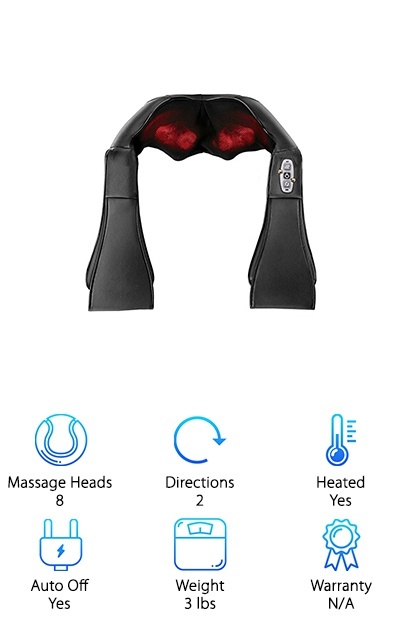 Our neck massager review found that this massager was a great way to unwind after a long day. It has a 5.9 ft cord, meaning it can go from an outlet on the other side of the room to where you’ll be relaxing into your massage on your couch while watching your favorite movie. The eight rotating nodes imitate kneading fingers, slowing working out all that tension you’ve built up through the day or week. This massager imitates the wonderful Japanese shiatsu massage, allowing you to sink into deep relaxation from the moment you put it on. The easy to use control panel includes three buttons, which control the heat, power, and direction of the massage. This massager also comes with a car charger for relaxing on long car rides or just on your morning commute. This massager can work with a 100-240V input. This little gadget brings the power of massage into your living room or office space. Its small, cushion-like design ensures that it fits in well with your existing decor. It also means it doesn't take up a lot of space and can be positioned at the back of a chair easily. This pillow-like design means that you can also move it around easily to get any spot you’re feeling fatigued in. This pillow massager changes direction every minute to keep you from getting fatigued in one spot from too much continuous massage. The automatic shut off feature means that you can use this massager with confidence. You know that it will shut off after 20 minutes if you happen to fall asleep or drift off with the massager on. The one-button control means it is easy to use. You just press the power button once to massage with heat, press it again to turn the heat off and hold it to turn it off. This body massager can be used to really get that spot that’s bee bugging you all day. This portable massager is great for getting specific spots on your neck or back. The 8 different vibration speeds will help you relax when you get home, and the 20 different modes will make sure you’re always able to soothe your aching neck or back. This massager is made of high-quality silicone material, so you know that it is built to a high standard of quality. This massager is waterproof, meaning you won’t have to worry about its durability. This is by far the most portable of the massagers on our list because it is cordless and charges via any USB port. Paloqueth promises a massager that is quieter than others, so you don’t have to worry about disturbing anyone in your household. Its small size means you can take it anywhere you go, so you can always relax, no matter where you are.